Here's a quick look at the bookmarks I made for my upcoming catalogue launch events. I have a stack of goodie bags with all kinds of treats in them just waiting to be handed out! If you'd like one, there's two ways to get one. You can either pick one up at one of my events in Campbell River or Nanaimo (contact me for more details) or place an order online using the hostess code "BU6GBSJR" and it will be mailed to you, complete with some cards to make yourself! I just wanted to share these super cute cards I made this week. I'm LOVING this new stamp set, it's a hostess set from the new catalogue called "Nuts About You". It includes all kinds of little animals to make your own little scene. And best of all, the only way you can get it is for FREE by hosting an event! Contact me if you have any questions, and all current products are available for purchase online. 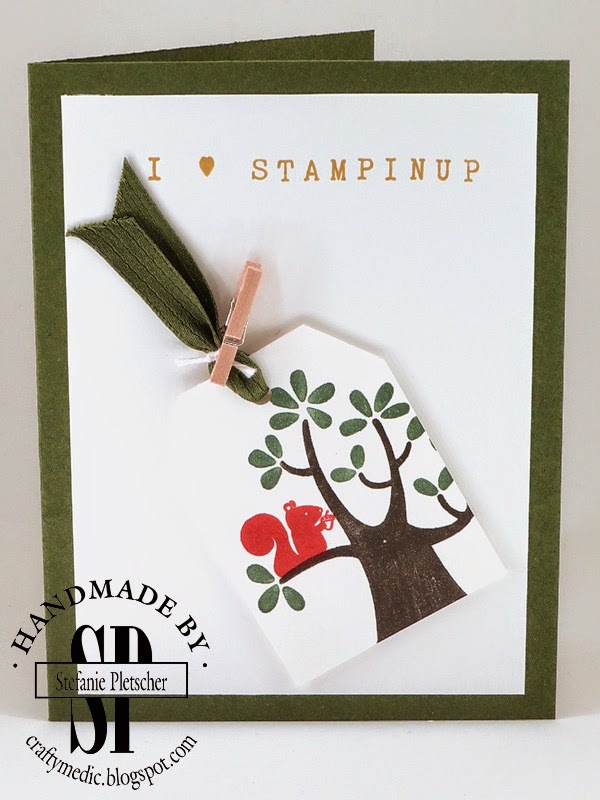 Being a Stampin' Up! demonstrator has been one of the highlights of my social calendar since I joined almost two years ago. I joined because I wanted a discount on my crafting supplies, and ended up with a great group of customers who get together on a regular basis to craft, and an active downline who inspire me every day. You can join just to buy for yourself, as a hobby to off set your own crafting, or as a business to make some money. My group has people of all kinds, and we're always here to support and inspire each other. Join during the promotion and you will also get a one month subscription to My Paper Pumpkin free from me, on top of the goodies I give all my new downlines! If I can get four people to sign up during this promotion, everyone of them will also get a free stamp set from the new catalogue, up to $14.95! Another week, another set of fabulous deals! Retiring Products Blow Out Sale! 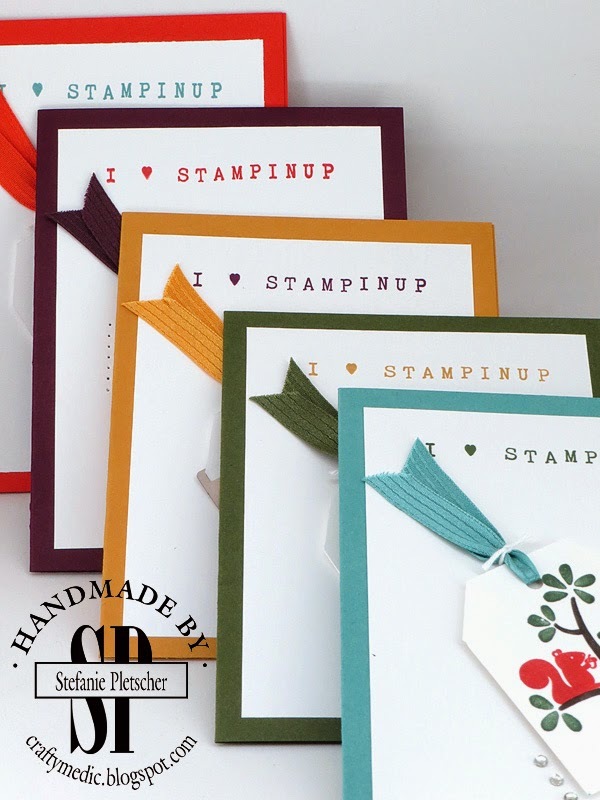 I just found out that Stampin' Up! is blowing out their retiring products! 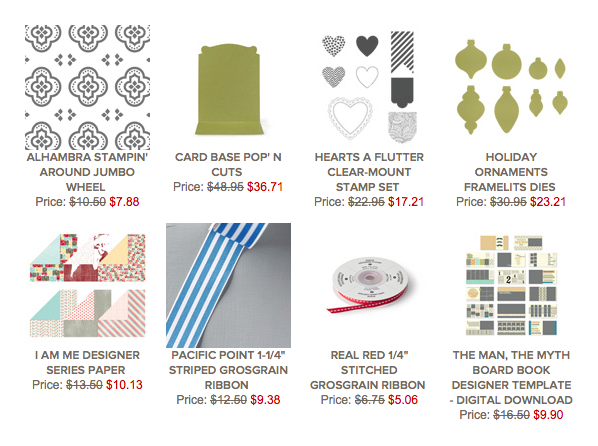 While supplies last, you can get some of these fabulous products for 25-50% off! Head over to the online store and place your order now, before these goodies are gone for good! Use the hostess code "BU6GBSJR" and you'll get some free goodies from me too. 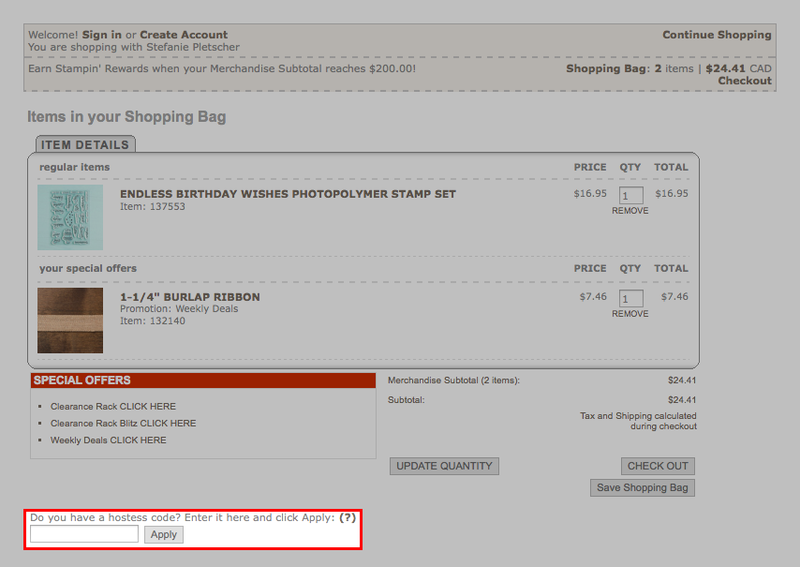 If you'd rather place an order directly through me, I can do that, but ordering online is the only way to guarantee what you order will be available. Get in touch if you have any questions! 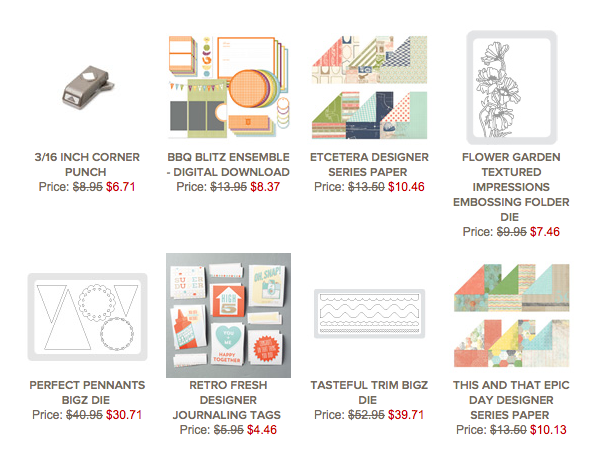 Don't forget that there's weekly deals and clearance rack items too! I wanted to showcase this awesome new product some more. So I got colouring. 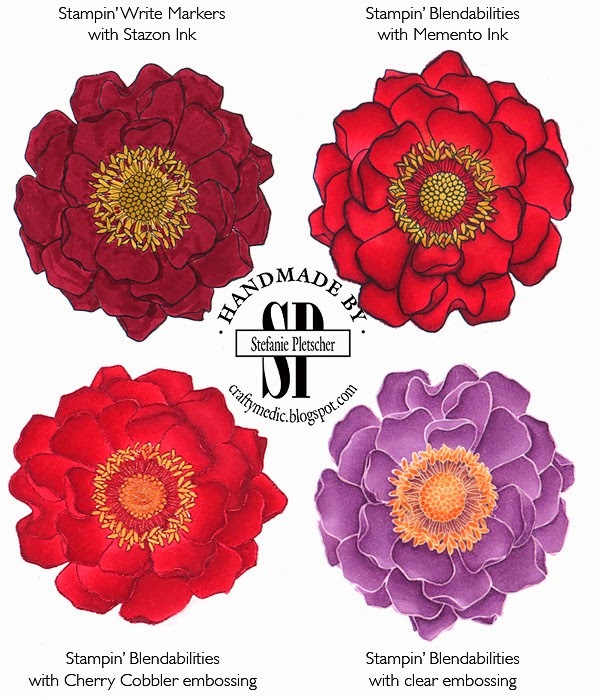 I spent a fair bit of time colouring in the same flower over and over in different ways. 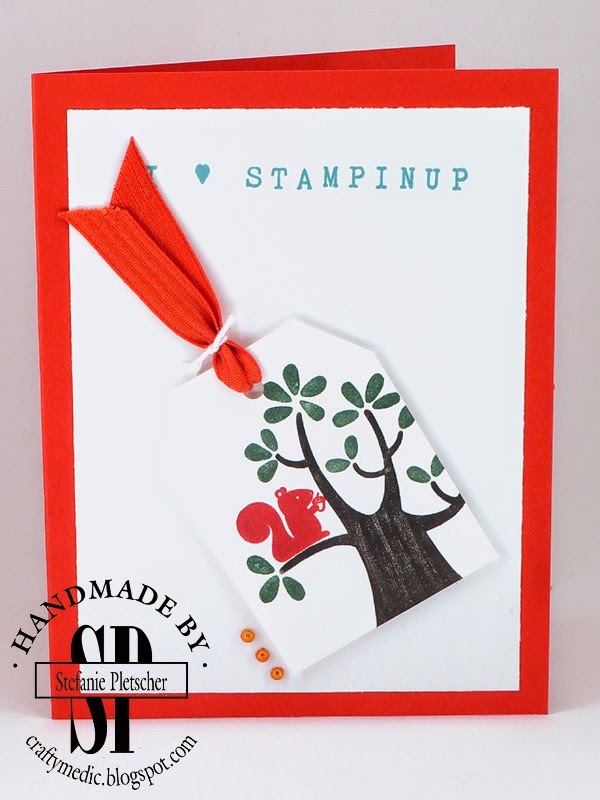 I love the Blended Bloom stamp, it's great fun to colour! As you can see, using different types of markers, and different stamping techniques, creates VERY different looks. I wasn't overly fond of how the alcohol markers stripped the colour off the Cherry Cobbler embossing in places, but I was over the moon with how the clear embossing ended up looking! The trick with these markers is to play! Just get them out and get colouring! They will be available in the new catalogue being launched soon, contact me for more information. Use the hostess code "BU6GBSJR" and you'll get some goodies from my catalogue launch coming up in a couple of weeks! This applies to all online orders, you can check out the Weekly Deals, Clearance Rack, and Retiring Items, all while supplies last! One of the things I'm VERY excited about in the new 2014-2015 Annual Catalogue is the new In Colors. While it hurts a bit to see some favourites go, these new ones are making me happier already! To showcase them, I decided to make a few cards. 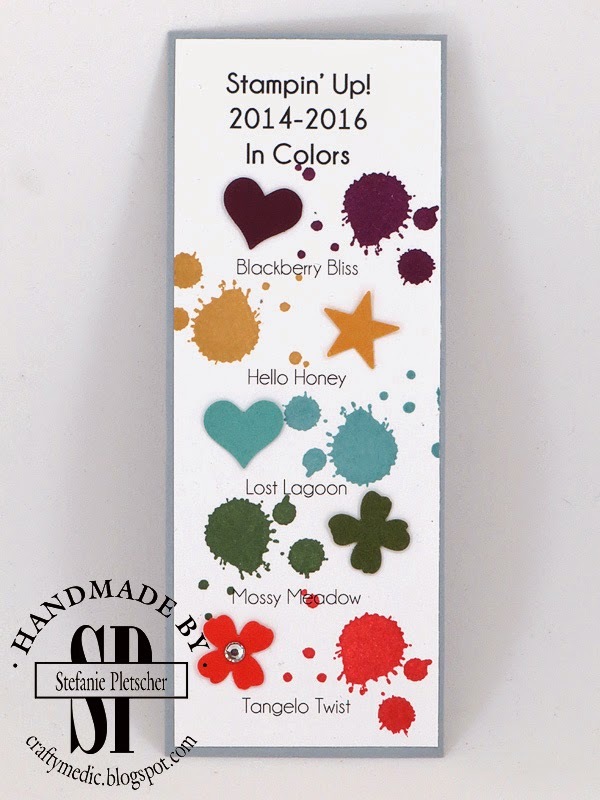 Each card features one of the new In Colors, Tangelo Twist, Blackberry Bliss, Hello Honey, Mossy Meadow, and Lost Lagoon. 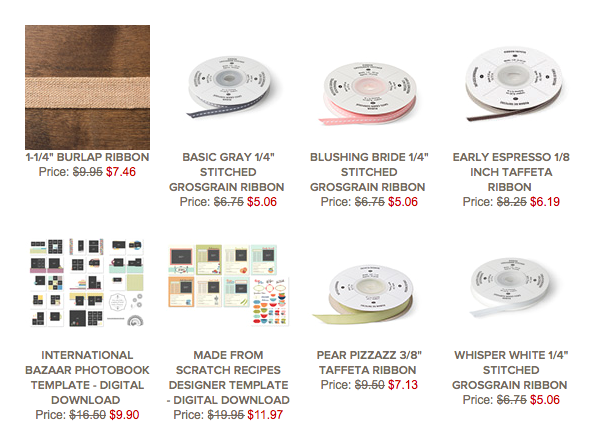 The card stock and stitched satin ribbon (brand new and AWESOME) match, while the sentiments contrast. The sentiment was custom created with the new Alphabet rotary stamp. It's huge, and brilliant! You can make it say anything you want (up to 13 characters) including some special characters. I also love the new hostess set Nuts About You that I used on the tags. The little squirrels are just so cute! 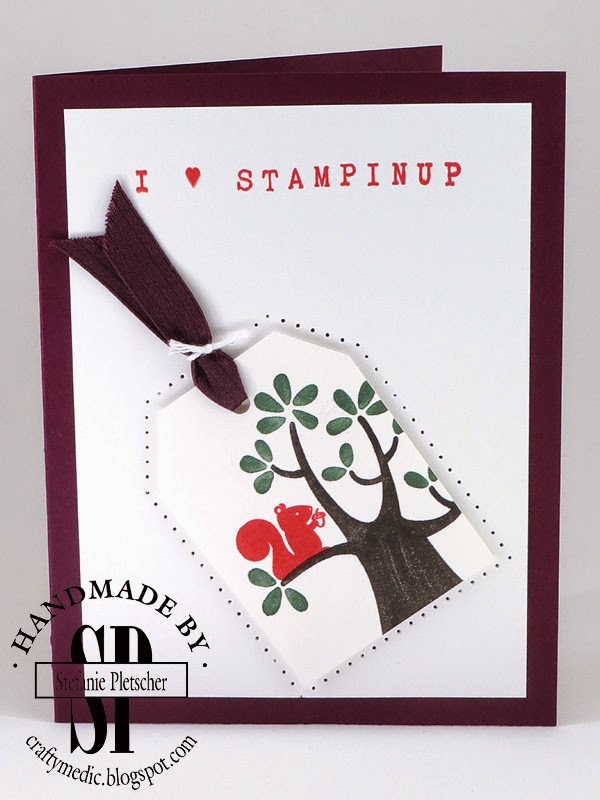 Each tag was punched out of Whisper White card stock using the tag topper punch, which are also in the new catalogue, then embellished with a different embellishment that's either new, or continuing. I even pierced a border around one with a new template! I also finally remembered to take a photo of my custom stamp on the back of a card. I tweaked it a bit for the watermark, but the look is the same. Now each of my cards goes out with my name and contact information on it! All of these colours and products will be available on June 2. In the mean time, you can order current products online, or contact me to get a start on an order for June! Welcome to my stop on the May Wacky Watercooler Blog Hop! If you're new to my blog you've probably come over from KatheD's blog, and welcome! 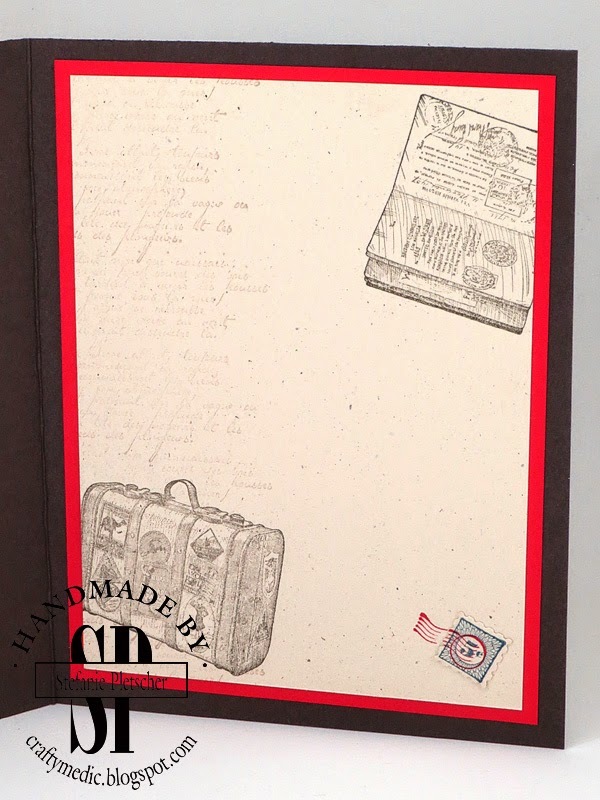 For those that are new to blog hops, you can go forward and backward using the water cooler buttons at the bottom of this post to check out the 15 lovely ladies around the world that have put up posts featuring some old and some new Stampin' Up! products and projects. Each of my projects uses a mix of retired (or retiring) product, current product, and product that will be in the new 2014-2015 Annual Catalogue, available on June 2nd. My first card features one of the new products I'm most excited about, Blendabilities! These alcohol based markers make colouring a breeze, and while I still love water colouring, I'm sure this will be a fabulous addition to my technique repertoire. 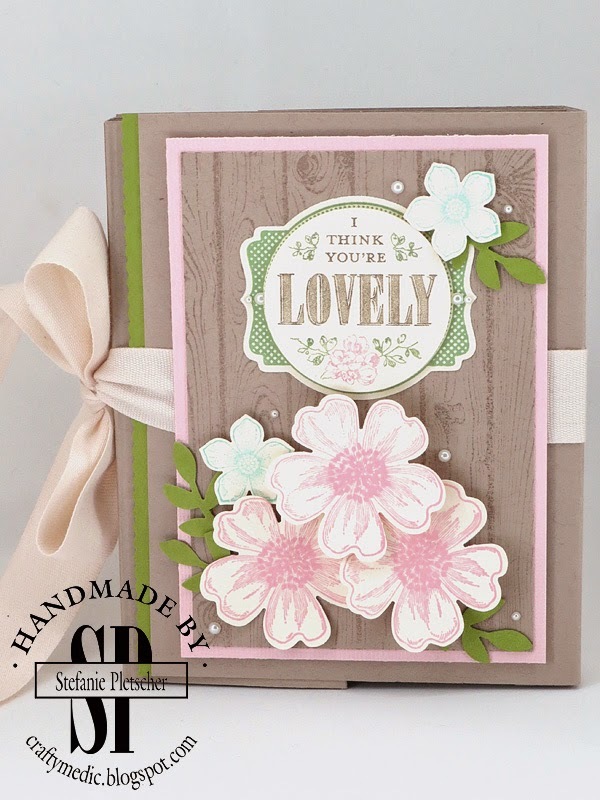 The Blended Bloom stamp I used here (along with the new Memento Tuxedo Black stamp pad) is so much fun to colour, and a snap to fussy cut. I also used a new hostess set for the greeting, and coloured a rhinestone with a matching Blendabilities marker (oh ya, you did know they did that right?). I am however sad to see Summer Starfruit leave as an In Color. I loved all five of the 2012-2014 In Colors, but Summer Starfruit was just a great in between yellow-ey green-ey shade that I just couldn't get enough of. Another product I'm sad to say goodbye to is the Watercolor Wonder card bases. I just discovered these right as they're leaving us, so luckily I still have a bunch, but they're so handy! 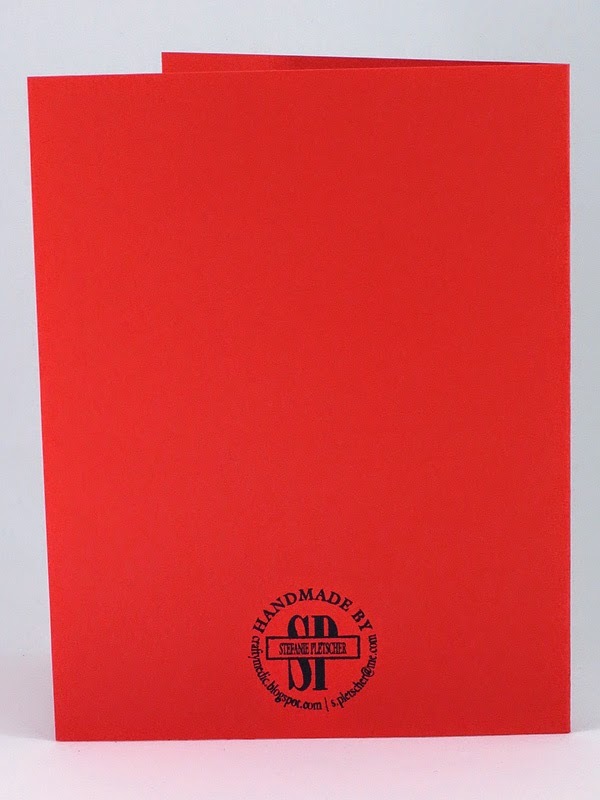 I used some matching colours on this one (Island Indigo, Gumball Green, Daffodil Delight and Real Red) and stamped the heart from the new set Something to Say a few times (including on the envelope). The ones I stamped on water-colour paper I punched out with the new matching punch (it comes in a pack with a super cute flower and star too) and popped them up on the card base. A quick sentiment in Memento ink, and in a few minutes time I have a thank you card done! Last but definitely not least, this was one of the sets I was the most excited for! Traveller is going to be a go to set for me for masculine cards for sure. 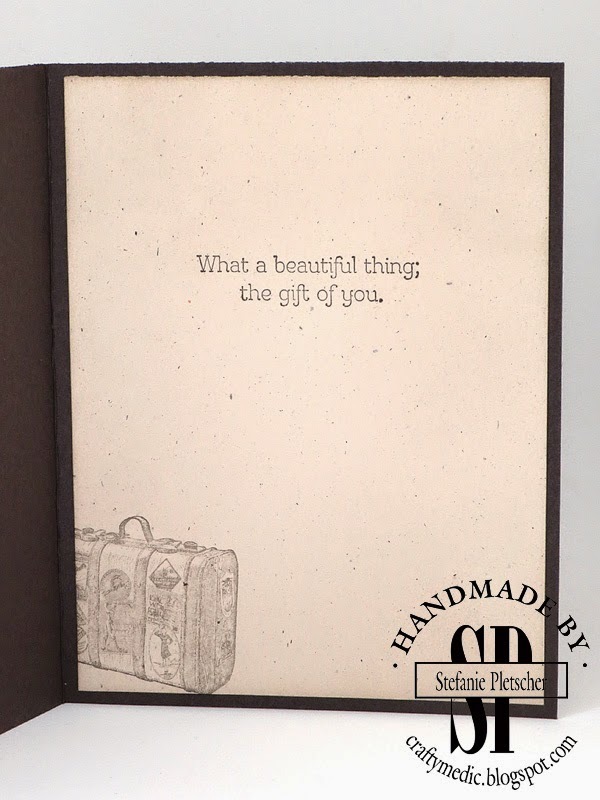 Here I paired it with sentiments from Gifts of Kindness, which is current and will still be available in the new catalogue. 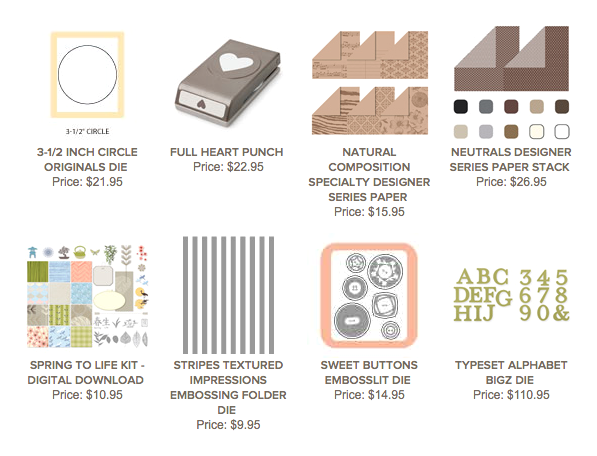 The Alphabet Press embossing folder I used on the front will also still be available! I'm so happy because I just got it, and am just finding fun ways to use it. The button I used is long retired unfortunately, they were some of my favourites. The Natural Trim ribbon is another favourite that sadly is leaving us, though there are some other great ribbons we will be adding! 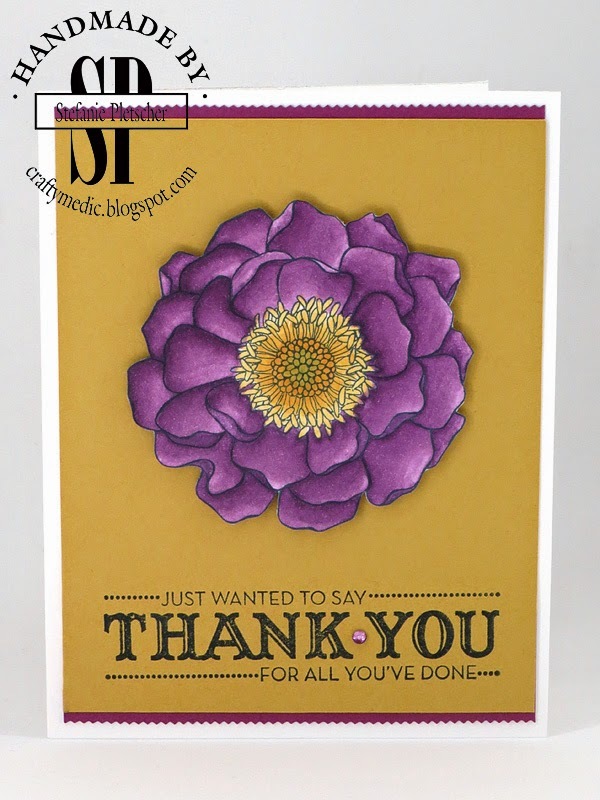 My biggest sadness about retiring products is also featured on this card. Core-dinations card stock was short lived, but so welcome in my craft room! I loved using it as regular card stock for a great texture, but also distressing it like I did here. I still have stacks and stacks of almost every colour, so I'm sure this won't be the last of it, but I'm very sad to see it leave the catalogue. So now pop on over to the next blog on the hop (Buffy) and check out the rest of the stops along the way! 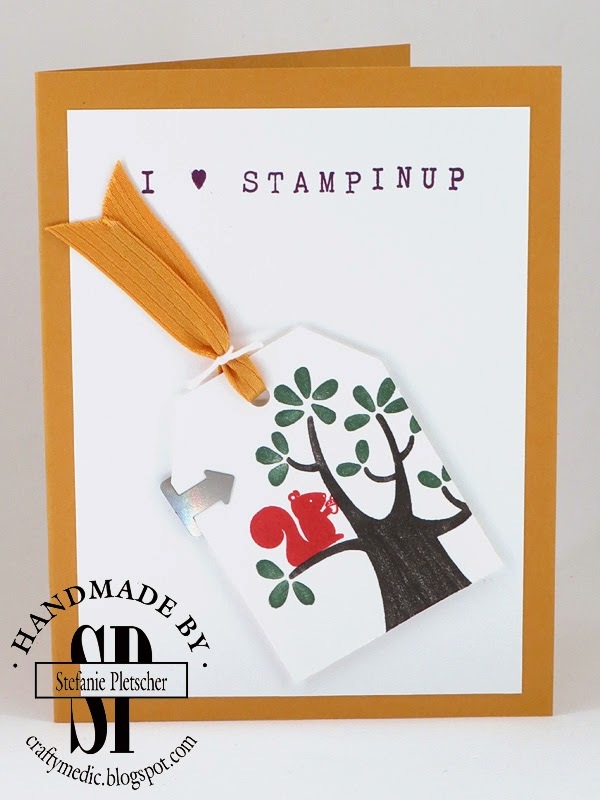 If you'd like to buy any of the products featured in my, or anyone else's, projects, get in touch with any Stampin' Up! Demonstrator to place an order. I had a lovely craft day with one of my downline, Sarah, the other day. We each made a flip flop album, and I loved the way she decorated hers! 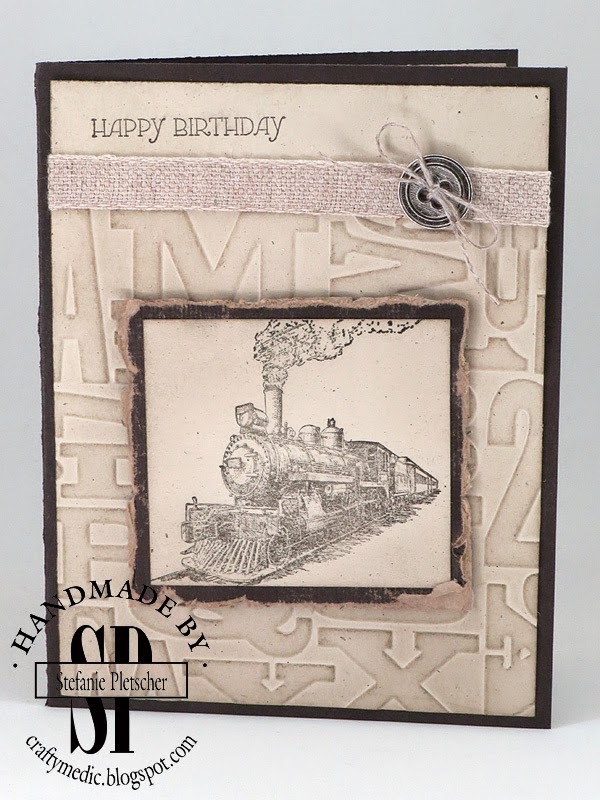 She used it as a birthday card for her husband, and the colours and stamps she chose jumped out at me. So I adapted it to a card! I did mix it up a little by using one of my new favourite stamp sets, which will be available for purchase on June 2. I've had Lovely Little Labels and the punch pack that goes with it for a long time (I think it was one of the first sets I ordered), but have never really used them. 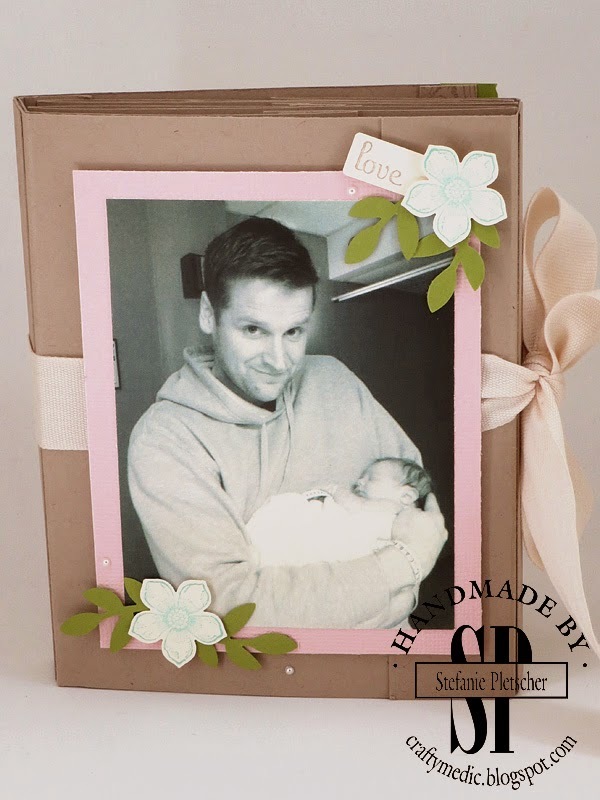 As Sarah was making her card/album, I pulled them out and we came up with this cute use for them. I also love the little red pearls. I used a Blendabilities alcohol marker (also available June 2) to colour them, and they match perfectly! To order any of the current products, you can shop online, or contact me. Some of the products used won't be available until June 2. Here's this weeks weekly deals! There is also a limited amount of the 2012-2014 In Colors card stock available, so if you need some, get it while it lasts! Not for my mom unfortunately, she got my My Paper Pumpkin projects. But one of the guys at work is a new dad, so I made him the ultimate Mother's Day card for his wife. I used my flip flop mini album as a base, then added lots of flowers and photos! 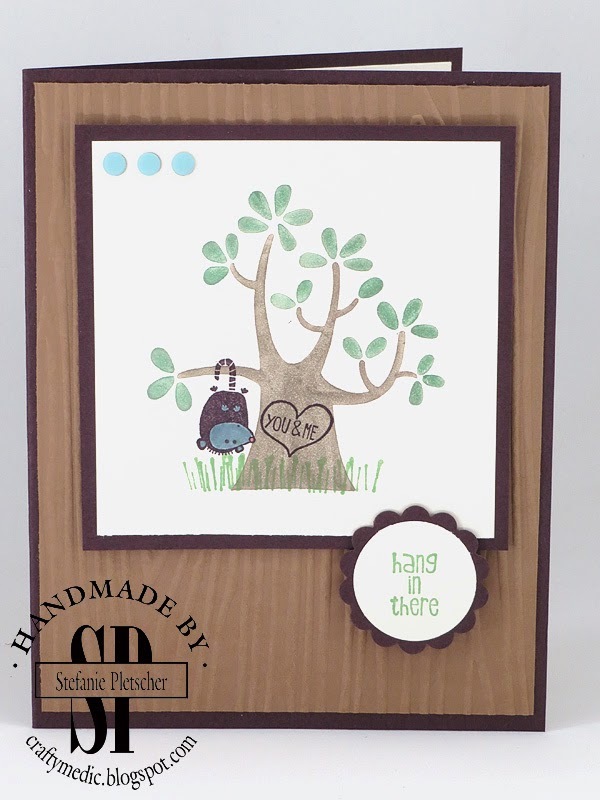 If you'd like to make your own album, contact me today to join one of my upcoming classes, or you can get the instructions for free if you buy a set of thinlits dies. It really doesn't get any easier than this! 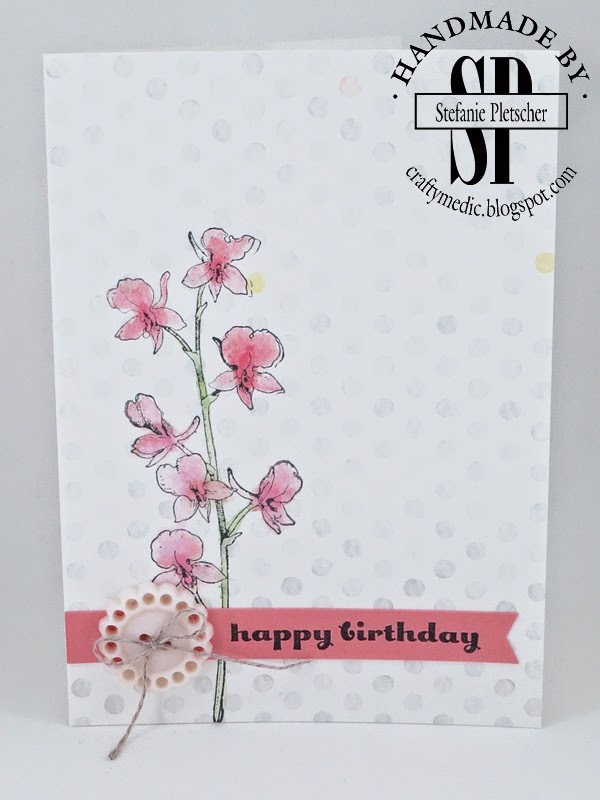 I'd completely forgotten I had the Watercolor Wonder card bases from the Occasions Catalogue, so when I went to go make a birthday card for a friends and ran across this lovely post by Patsy Waggoner, I went digging for them. All in all, it took me about five minutes to make this card, including looking for the bases. The card bases are still available but only until May 31st. It's a set of 4 each of 5 different designs, so you get bases and envelopes to make 20 cards, all for only $15.95. Easy peasy right? Take a look on the online store! Here's this weeks deals! Don't forget about all the great deals to be had in the clearance rack too! So I think most people who know me know I have a sick and twisted sense of humour. If you didn't know that, now you do. I had another co-worker's birthday to make a card for, and I knew I had to be funny with this one. This particular coworker had introduced me to this video (might not be safe for work), and we laughed long and hard at it. So I adapted that to a card! Have I mentioned I love being able to make custom cards with inside jokes and personal touches? Well I do. I got my colour scheme from my Color Coach, an awesome tool that makes making cards from scratch a breeze! I knew I wanted to use Old Olive for the turtles, so I used that as a starting point and the Color Coach suggested Pumpkin Pie and Cherry Cobbler, which worked beautifully! Both stamp sets are retired now, Banner Blast from SAB this year, and Fox & Friends from a while ago. 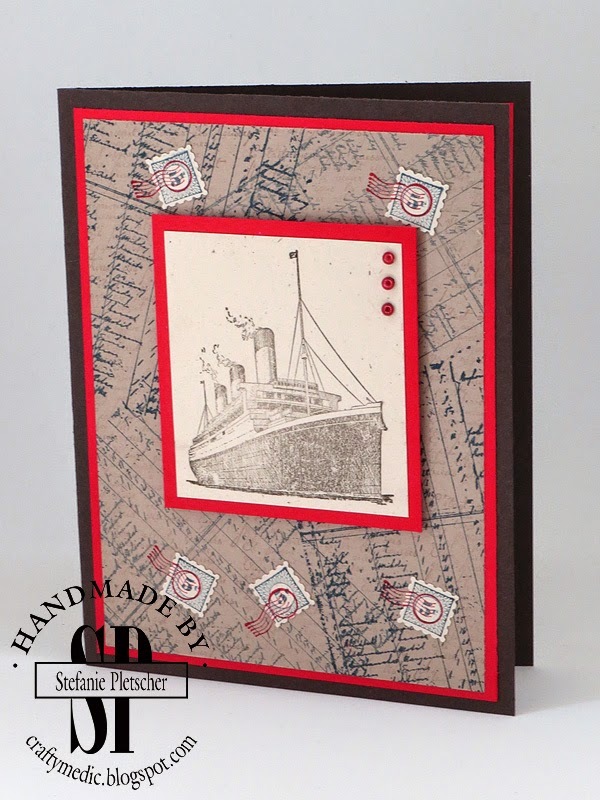 The banner punch will be available in the new catalogue starting June 15th though, along with some new stamps! Email me if you'd like an invite to one of my free catalogue launch parties, complete with snacks, a make & take, and a chance to play with some new products!